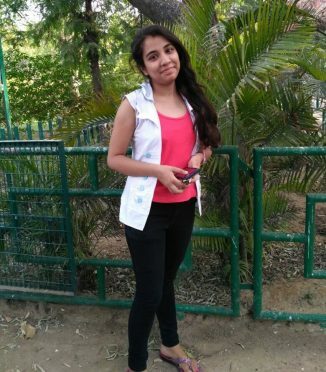 About the Author: Karishma Arora, a student of Dr. B.R. Ambedkar Centre for Biomedical Research (ACBR), DU, shares the amusing journey of her internship at JNU. Those were the struggling days – semester exams, preparation of CSIR-NET, and search for an internship. Rejections from prestigious institutes like IISERs and IITs had instilled in me a slash of pessimism. When the notice of interning at Jawaharlal Nehru University (JNU) came, I didn’t want to apply; nonetheless, constant nagging of my friends and family made me prepare a write-up on ‘Why does science interest you?’ as required for the application. I included my reasons for choosing science as a career, included quotes from eminent scientists, and added details about my areas of interest, i.e. Immunotherapy as an upcoming option to treat diseases. I emphasized why I wanted to join JNU and the importance of science and research for the prosperity of mankind. The write-up was to be forwarded by the director along with the educational documents and resumes. I insisted him to recommend me and forward my application. The shortlisting was to be done on the basis of merit, resume, and the write-up. It was the day of declaration; with throbbing heart and shaking hands, I scrolled the list and found my name. I was one of the 30 students who got the golden opportunity to intern at JNU. I, along with my friends and family, rejoiced as this was surely an achievement. Amid lusty trees and broken rocks, I walked down the roads of the campus and reached the convention center of JNU for the introductory lecture and brunch. An inspiring talk by the V.C. was a cherry on the cake. We proceeded to School of Life Sciences where the internship was to be done and guides were allotted to us. I had no prior lab experience and started from the scratch. I was working in the Eukaryotic Gene Regulation Laboratory. Stepping into the lab, I encountered arrays of chemicals and gigantic machines. My guide assigned me the project topic which was To Study Iron Metabolism in Candida albicans. In my tenure of 40 days, I learnt basic molecular biology techniques including media preparation, PCR, western blotting, transformation, and screening. Apart from these, I got a chance to perform new methods like spot assay and electroplating. Sometimes, I worked at night and took care of machines, performed experiments all by myself, and shut down the instruments without fail. These responsibilities made me confident and added to my experience. I also helped Ph.D. scholars with their work which helped me gain insights into various subjects. I made blunders but was forgiven, taught, and consoled; amid the hassle, I completed my project under the guidance of my guide, Mr. Manjit. We also had two-hour classes from eminent teachers which enhanced my knowledge and aided me in entrance exams. I loved ‘the busy life’ – working in the lab, preparing reports, and having fun at the hostel. I made some great friends during my stay at the hostel. Eating together, having long late night conversations, lab discussions, sharing stuff, and wandering together made for the cherishable memories. There were students from all the states of India which exposed us to various cultures and traditions. We explored JNU and hung out at canteens, dhabas, Parth Sarthi rocks, open air theatre, caves, and the 24/7 open library. I also got to display my writing skills in the essay competition held on the International Yoga Day wherein I bagged the second prize and got lauded for the debate and yoga competitions. From gaining knowledge and hands-on training to making friends and lifelong memories, the internship offered a full-fledged package of joy. It was a journey of immense learning, upgrading the skills, building relations, and adding worth to my life. We were awarded the certificate and a book at the validatory ceremony. Enrolling in a good internship is not a cakewalk but all it needs is constant efforts, awareness, and hope. Keep your spirits high and keep trying because an internship can change your life. Does Karishma’s journey excite you? Check out these cool biology internships. You go girl! That is a very inspiring story! Making your friends at ACBR extremely proud! The Internship Challenge has allowed me to increase significant experience appropriate out of school and will direct me to the correct activity sometime in the future. An internship can provide the advancement that potential employees often need as they compete for employment positions in the workforce. Internships can be tricky to find however and many people overlook great internship opportunities simply because they did not know where to search. Finding a successful internship can open many doors to rewarding careers so consider the following points before you begin your search for that perfect internship. Life science is any of the branches of natural science dealing with the structure and conduct of living beings microorganisms, plants, animals. There are a lot of new emerging streams in the life science field like biotechnology, microbiology, bioinformatics, biomedical medical engineering etc. The professional writers can also help UK students who can ask to write my thesis with the best writing skills. In the Era’s of education, technology plays a big role in lots of elements of life, and education isn’t any different. an era is unexpectedly changing the manner college students study and the way teachers teach. Every student wishes to attain good grades for his bright future but this seems to be a hard nut to crack as today the competition has increased so much and every student tries his best to secure his future.